Below are some notes I took while working through chapter 2 of my favorite Python machine learning textbook. Define an activation function that takes a linear combination of certain input values x and corresponding weight vector w, where z is the so-called net input (). Denote particular input sample as . 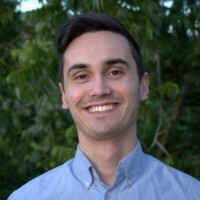 Init weights to 0 or small random numbers. Compute the output (predicted class) value using the aforementioned step function. Convergence only guaranteed if the two classes are linearly separable, and learning rate sufficiently small. Set a maximum number of passes over the training dataset (epochs). A threshold number of tolerated misclassifications. # Initialize weight vector to zeros. # X.shape returns the numer of features.
""" Calculate the net input. (i.e. do dot prod)"""
""" Return class label after unit step. """ # if it is, returns 1, otherwise returns -1. Features considered: sepal length, petal length. Use the pandas library to load the Iris dataset into a DataFrame object. Extract the first 100 class labels. Visualize input data features/label in a scatter plot. Train the perceptron algorithm on the Iris data subset. # Step 1 : Load datset into a pandas DataFrame. # Print the last five lines. 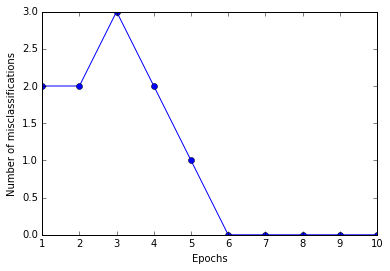 # Steps 2 and 3 : Extract our (simpler) desired subset and plot. # Extract the first 50 Iris-Setosa and 50 Iris-Versicolor flowers, respectively. # (2) the 4 means "only the (zero-indexed) 4th column of those entries, specifically. # (3) .values means we only return the values, not their original indices. 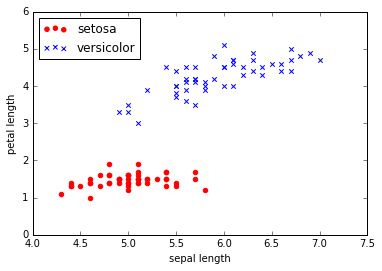 # Convert the class labels to integer labels: Setosa(-1), Versicolor(1). # getting the 0th and 2nd columns from the df object. # Plot setosas in 2D feature space and mark with circles. 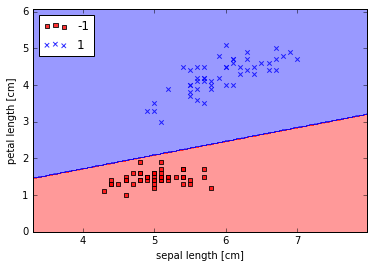 # Step 4 : Train the perceptron and make plots. # Figure above shows that convergence occurred after 6th epoch. # Implement awesome visualization function for decision boundaries of 2D datasets. # Setup marker generator and color map. # Get the min/max (of each) feature values in the dataset. # (1) np.arange(start, stop, step) // Note: step will be nx or ny in meshgrid comment below. # ----> Input: x, y are arrays of length (nx, ny) respectively. # --------> xx1 = NY number of copies of the input array X. # --------> xx2 = NY number of arrays where the ith array is the ith y-value from input Y, NX times. # Assign class prediction on matrix grid of POSSIBLE (x1, x2) values (no real corresp with data yet). # np.ravel() is basically np.flatten() except doesn't make a copy, but rather keeps original in some sense. # in the grid array. 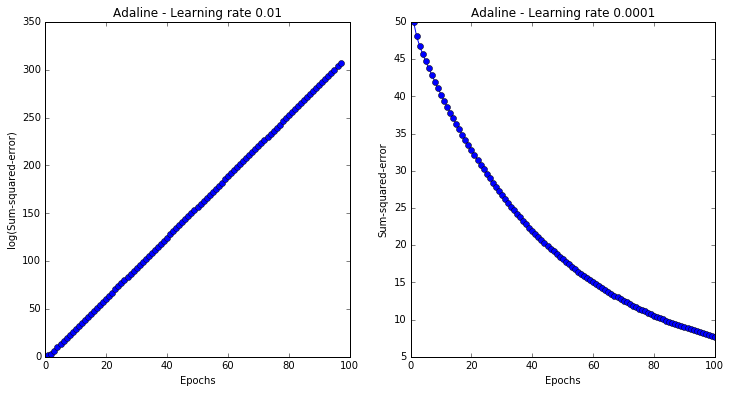 ADAptive LInear NEuron (Adaline): Uses a linear activation function, , rather than the step-function used by the perceptron. Interesting bc lays groundwork for understanding more advanced ML algorithms. NOTE: Resulting output is identical to perceptron since the activation function is directly fed to a quantizer in order to predict the class label. The difference is that the weight updates use the raw output of the activation function . See figure in page 33. Define an objective function that is to be optimized during the learning process. Is often a cost function that we want to minimize. 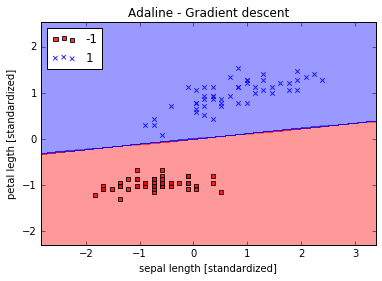 For adaline, can define cost function to learn the weights as the Sum of the Squared Errors (SSE) bw the calculated outcomes and the true class labels. Factor of 1/2 just added for convenience; makes gradient derivation easier. Based on all samples in training set, which is why also referred to as batch gradient descent.
""" ADAptive LInear NEuron classifier. """ """ Learn the weights. """ # X.T.dot(errors) is sum of input x^i vecs multiplied by scalar difference y^i - phi(z^i).
""" Returns vector of dot products between samples and current weights. """ """ Adaline activation is the identity function. """ 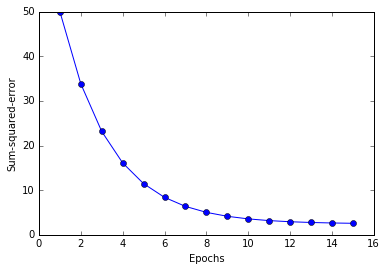 # Plot the cost against the number of epochs for two different learning rates. # on the other side of the parabola at a higher value, thus doing the opposite of minimizing basically. Gradient descent can benefit from feature scaling. Here we use a feature scaling method called standardization which gives our data the property of a standard normal distribution. Mean of each feature centered at 0 and standard dev of 1 (for the given feature column).